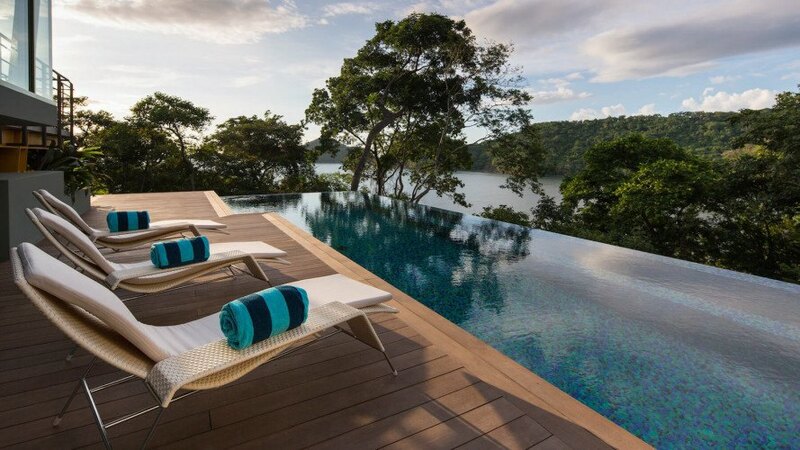 Tropical luxury doesn’t get much better than Casa Magayon, an enviable private home set atop a steep hillside in Costa Rica. Designed by SARCO Architects, the house spares no expense yet it has a minimal energy footprint. The eco-friendly home is topped with insulating green roofs and incorporates passive solar principles to reduce dependence on air conditioning. 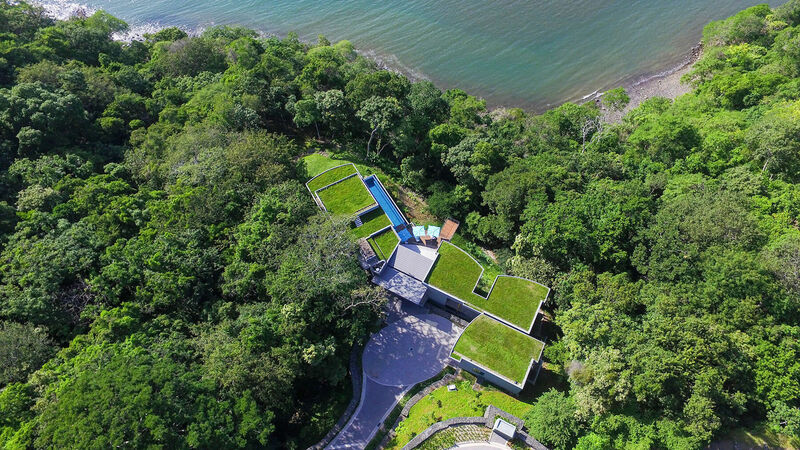 Located on a steep and challenging site within Guanacaste’s Peninsula Papagayo Luxury Resort, the 1,290-square-meter Casa Magayon was designed as a series of glass-clad modules to mitigate the site’s sharp 20-meter drop between the road front and linear ridge. The modular structure steps down along the natural terrain to minimize the amount of earth moved during construction. Choosing the challenging slope for the property paid off—Casa Magayon is located extremely close to the Pacific Ocean and offers great views as well as opportunities for hiking, with direct paths from the home to the rocky beach below. The home comprises independent glazed modules connected by breezeways that reinforce a constant connection with the tropical surroundings. The indoor-outdoor connection is strengthened by the arrangement of spaces and use of materials that appear to seamlessly flow from the exterior to interior spaces. A large outdoor area forms the centerpiece of the home and includes multiple patios and a deep lap pool. SARCO Architects also designed Casa Magayon’s interior, which features a muted and natural palette of materials comprising glass surfaces, grey polished concrete floors, warm wood paneling, porcelain tiles, and white plaster walls. Each module was carefully placed to take advantage of passive solar conditions and to make it easy for the owners to shut off air conditioning in unused parts of the home. 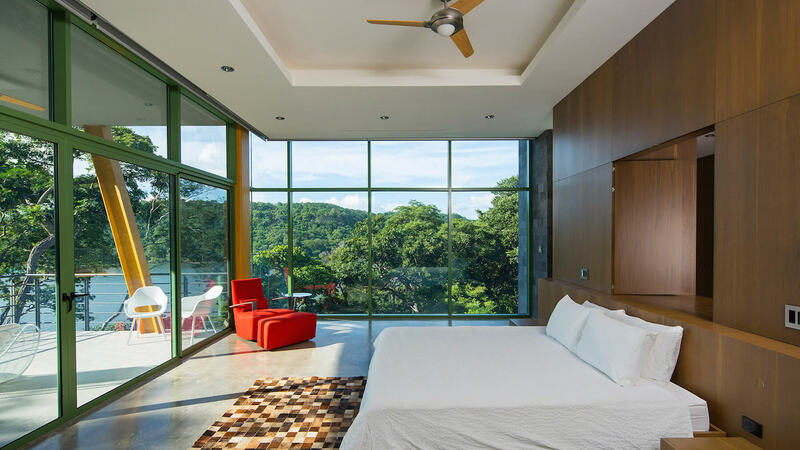 Located on a steep and challenging site within Guanacaste’s Peninsula Papagayo Luxury Resort, Casa Magayon was designed as a series of glass-clad modules to mitigate the site’s sharp 20-meter drop between the road front and linear ridge. The modular structure steps down along the natural terrain to minimize the amount of earth moved during construction. Choosing the challenging slope for the property paid off—Casa Magayon is located extremely close to the Pacific Ocean and offers great views as well as opportunities for hiking, with direct paths from the home to the rocky beach below. The home comprises independent glazed modules connected by breezeways that reinforce a constant connection with the tropical surroundings. The indoor-outdoor connection is strengthened by the arrangement of spaces and use of materials that appear to seamlessly flow from the exterior to interior spaces. A large outdoor area forms the centerpiece of the home and includes multiple patios and a deep lap pool. SARCO Architects also designed Casa Magayon’s interior, which features a muted and natural palette of materials comprising glass surfaces, grey polished concrete floors, warm wood paneling, porcelain tiles, and white plaster walls. Each module was carefully placed to take advantage of passive solar conditions and to make it easy for the owners to shut off air conditioning in unused parts of the home.